Tássia was born in Santos but has been living in São Paulo for more than 10 years now. 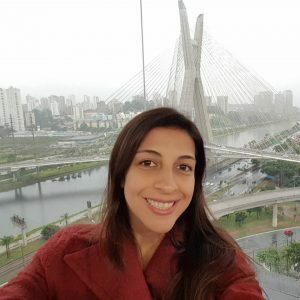 She has a Bachelor’s degree in Social Communication at ESPM-SP and started her career as a trainee at Vivo, the most valuable telecommunication brand in Brazil by the Telefónica group. She chose branding as a career based on the insight that brands work like a culture inside companies and therefore have the potential to inspire social transformation by creating relevant communication and experiences that can make a difference in peoples’ lives. At Telefónica, she worked close with the Foundation team, helping them to translate the brand purpose into their projects and communications, promoting a new way of seeing education, enriched by technology. She got into the Volunteer Committee, promoting academic activities with children of Public Schools of Sao Paulo. In 2017, she participated in an international volunteer project in Peru during her vacation, spending two weeks in a child asylum. This trip was a tipping point in her life. Since then, she understood that she wants to work close to communities, promoting education and inspiring them to find their own way on life. After 8 years trying to create change in the private sector, she was dissatisfied with the outcomes and decided to study Social Innovation Management to better understand how to design for impact. She dreams to work as a social consultant focused on small social businesses, enabling people and inspiring them to promote changes in their communities. Aside, she wants to develop academic surveys on the impact of education on social improvement.